Ocular allergic disease is characterized by an inflammatory response of the conjunctiva. This hypersensitivity response affects 15-20% of the population (1,2). Allergic conjunctivitis is characterized as IgE mediated, T cell mediated, or responses of both. Allergic responses affect the conjunctiva, the cornea and the eyelids and can be chronic or acute. Acute allergy is caused by IgE-mediated mast cell degranulation. Chronic allergic disease is caused by continuous activation of mast cell and other inflammatory mediators. 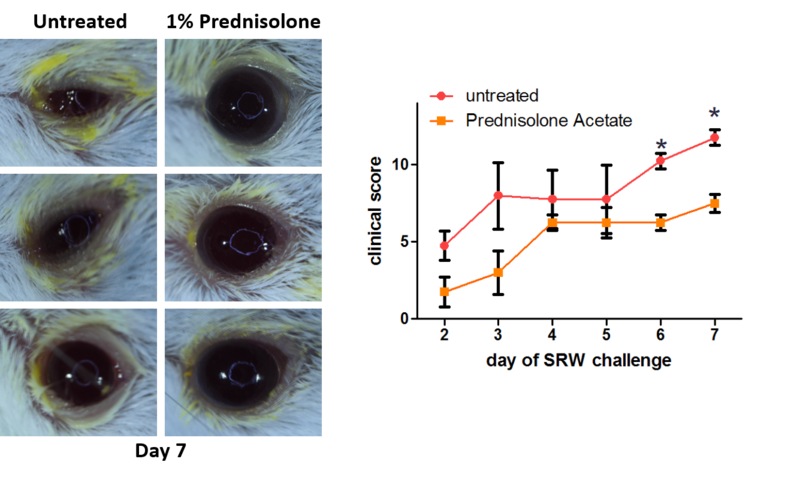 In our murine model of allergic conjunctivitis, mice are immunized with short ragweed pollen (SRW) or ovalbumin (ova) prior to ocular challenge with SRW or ova. Allergic responses are evaluated by clinical score assessment (chemosis, conjunctival redness, lid edema, tearing/ discharge, and hyperemia), expression of Th2 associated cytokines in the conjunctiva by qPCR or ELISA/ multiplex assay, histological quantification of neutrophils, eosinophils, and mast cells in the conjunctiva, quantification of systemic IgE levels, or quantification of neutrophils, eosinophils, and mast cells in whole blood. 1. Butrus S, Portela R. Ocular allergy: Diagnosis and treatment. Ophthalmol Clin North Am. 2005;18:485–92. 2. Singh K, Axelrod S, Bielory L. The epidemiology of ocular and nasal allergy in the United States, 1988-1994. J Allergy Clin Immunol. 2010;126:778–83. e6.